This is a wonderful nite light or just a nice little Christmas collectible that will accent your Precious Moments figurines at Christmas. Made of smooth glossy porcelain. Nice size, measuring 7 1/2" tall and base measures 3 1/2" x 7". 5 ft cord with on/off switch, controls 2 Christmas light size bulbs. Figurine is of a little girl decorating a Christmas tree, and when lit, the porcelain figures gives off a nice soft light. Beautiful condition, There is a very tiny flake on the underside of the bottom but I'm not sure if its a flaw or small chip. It does not show. A perfect gift item! 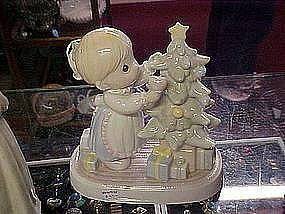 Dated 1993 Precious Moments, Enesco, lisenced product. Email me for photo.